Atlanta was hit by numerous storms earlier this year, starting with an F1 Tornado on or about June 1st in which the City of Lilburn area was hit rather badly during that storm. The weekly thunderstorm pattern resulted in damage through August across the area. Looking back it seems that our crews were simply being prepared for the major challenge that was on its way. • the tree was unstable. • many of the limbs extended over the concrete side rails into the pedestrian corridor. • the side rails were cracked in some places and some had shifted. • many of the limbs were situated as spring poles against the side of the bridge. 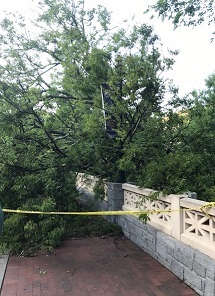 The Emory grounds and transportation staff had already barricaded partial access on the bridge for general safety purposes, but did have to maintain some access due to the central nature of the location on campus. Safe and coordinated removal was of high importance to avoid any failure of the structure of the bridge itself as well as the infrastructure running under the bridge. Engineers were called in to identify the utilities involved and prepare for any associated risks. The conduits carried fiber optics serving much of the school as well as the hospital, as well as other purposes, were identified. Of major importance were those communication lines, vital to allow the surrounding entities to function. 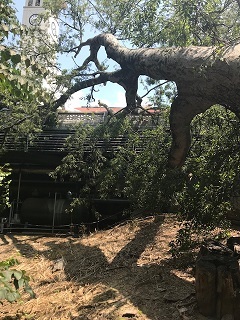 Arrangements were made to ensure that utility services would be available should any damage occur during the removal process. Caldwell employees worked closely with Jimmy Powell, Emory manager of Roads and Grounds as well Bob Simon, who also serves as the section manager, to fully understand the issues related to developing an scope of work that was acceptable to all parties, and which minimized risk for campus and crew alike, and developed a clear operational plan in order to achieve the objective – which was to carefully remove this tree without more damage or injury, to person or property. Although Caldwell Tree Care has its own crane, the sheer size, weight and reach distances to the tree required two 100 ton cranes to help insure the most positive end result to the operation. The Team held meetings with the various campus services department heads, including engineering, roads and grounds, police, and others affected and needed in the operation. A general briefing as to the overall operation plan was presented to all involved once the team was assembled. This inclusive team allowed for the safety procedures for the campus community to be put quickly into place. The nearby road was closed, manned barricades were put in place to support that closure and the pedestrian rerouting with caution tapes used to create safe lanes, to both allow campus movement and in such a format to protect the work zone and the crew involved in the removal. 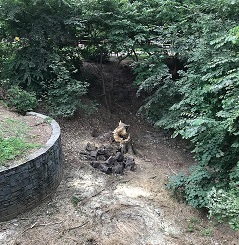 The Emory staff performed the public safety function flawlessly surrounding and within the job site, thereby allowing the tree workers to concentrate on the job at hand. 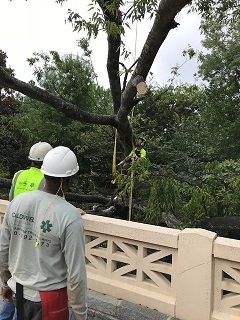 The crew from Caldwell Tree Care consisted of Terry Ferdarko – Tree Care Supervisor, Dave Loring – Crew Leader and crane operator, Willie Catlin – Crew Leader, and Joe Schifani Junior Crew Leader. James Foote, certified arborist, coordinated the team and logistics. This team from Caldwell brought 125 years of experience to the site. The Phoenix Crane team included the operators for the two 100 ton cranes, as well as supporting personnel. Once the work day arrived, the job site had been “brushed out” by another crew; thereby allowing a clearer view of the trunk itself. With the cranes in position a pre job briefing occurred, all safety considerations were reviewed and implemented – with PPE in place, the battle ensued. Communication head sets were integrated between the Caldwell and Phoenix teams as the Caldwell Tree team was often not visible to the crane operators, however to ensure safety Phoenix team brought a rigger for eyes on hand communication between the Caldwell Tree Crew and Crane operators. An Emory utilities engineer stood by to watch for the safety of the infra-structure pieces. 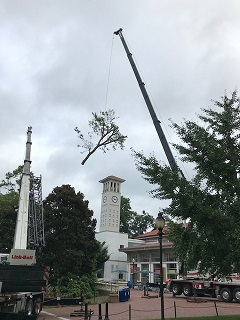 With two cranes, the job was set up with one crane dedicated to holding the main trunk while the other was utilized to handle the picks as the job progressed. The usage of the two cranes also allowed the eco-system under the bridge, which included a protected stream bed, to be exposed to as little disturbance as possible. All told, the job involved approximately a dozen picks to remove the trunk pieces as the removal progressed. The crew leader reported that it was “another normal day out of the office” and there were no issues with the process. 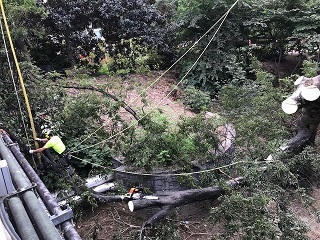 All the pieces and personnel worked together well, and, in the end, the utilities service personnel had an easy day since there was no damage to any of the services under the bridge. Reflecting back upon what an amazing job this fully integrated team performed, we can conclude that bringing experience, skill, proper planning and safe process practices are among the aspects that make leaders in the market place. We at Caldwell Tree care give our thanks to Emory for their trust and to Phoenix for their partnership in this challenge and learning experience. All came together and saved the day…. and the bridge!!! Behind the Machines: The Caldwell Tree Care Version!